In a state known for Tobacco Road and NCAA Basketball, professional football has been a part of the Carolina sports scenes since 1996. The push for a NFL franchise began in the mid to late 1980s, after Charlotte was awarded an expansion NBA franchise. In 1987, former NFL player Jerry Richardson led the effort to obtain an expansion NFL franchise. He was joined by politicians, citizens and businesses from both North and South Carolina in his bid for a team and to construct a new stadium. Prior to being awarded a franchise, several sites were under consideration for the location of a new stadium. Possibilities included near Lowes Motor Speedway, Center City in Charlotte, and Carowinds Amusement Park where the 50 yard line would be on the NC/SC border. QB Kurt Warner throws for 4,353 yards and 41 touchdowns winning the NFL MVP in 1999. RB Marshall Faulk receives Offensive Player of the Year in 1999, 2000 and 2001; and NFL MVP in 2000. Professional football in Charlotte became a step closer to reality in 1991, when the NFL announced they would expand by two teams. Five cities were in contention for the two teams, including Charlotte, St. Louis, Baltimore, Memphis and Jacksonville. Fans in Charlotte had always dreamed of having a local NFL team. In October 1993, that dream became a reality when the NFL announced that Charlotte would receive a franchise. Named the Carolina Panthers, they would begin playing in 1995. After being awarded a franchise, Richardson announced that the Panthers stadium would be built in Center City in downtown Charlotte and financed through the sale of Personal Seat Licenses. Originally, LM Ericsson bought the naming rights and the stadium was named Ericsson Stadium. In January 2004, the Panthers and Bank of America agreed on a 20 year deal to rename Ericsson Stadium, Bank of America Stadium. Bank of America Stadium was not complete in time for the 1995 season. The Panthers had to play their inaugural season at Memorial Stadium, home of the Clemson Tigers (NCAA). Bank of America Stadium was completed by the start of the 1996 season. It ushered in a new wave of stadiums in the NFL as more than two dozen stadiums have opened since 1996. The Carolina Panthers played their first game at the stadium on September 14, 1996. Bank of America Stadium is one of the NFL’s premier stadiums from the inside to outside. Located in downtown Charlotte, the facade of Bank of America Stadium is very unique, consisting of massive archways and domed towers. It features a striking black obsidian granite facade. A pair of black panthers, each eight-feet-tall and weighing 2,000 pounds, perched on ten-foot pedestals, are located on both sides of each of the three 80-foot arched entrances. Lit and glowing every night 48-foot diameter light domes atop the entry towers. 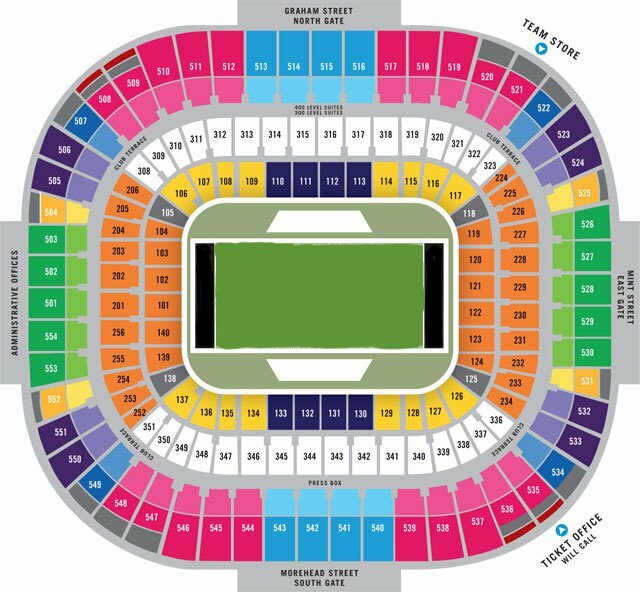 Bank of America Stadium consists of over 73,000 blue and silver seats in three tiers that circle the playing field. It has many amenities including the Gridiron Club and 158 luxury suites. Bank of America Stadium also includes three practice facilities, training facilities and administrative offices. The stadium has changed little since its opening in 1996. A new 31.5ft by 77ft High Definition Diamondvision scoreboard was added before the 2008 season. 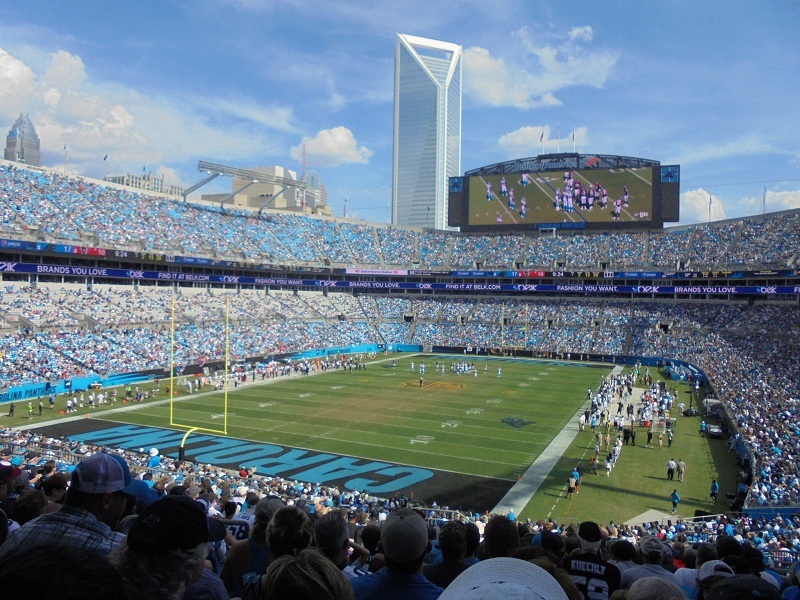 In January 2014 the Panthers unveiled a $65 million improvement plan for Bank of America Stadium. Improvements included four new escalator towers to take fans to the upper deck faster, new 200 feet wide and 60 feet high videoboards and a new sound system. This project was completed by the 2014 season.